Sign up to win below! Cool 101 is giving away tickets to see Elton John at Van Andel Arena on October 15. Listeners will have multiple chances to register for tickets. Just use the Cool 101 Song Generator below to find "Your Song". It will tell you which Elton John song is yours. Then, every time you hear that song on Cool 101, call in to get registered for tickets. The Cool 101 studio number is 269-343-1111. You may enter every time you hear your song, but you can only register when the song you were given is playing. The contest will run from Monday, September 17 through Friday, October 5. 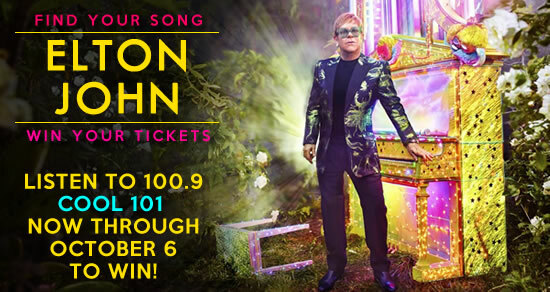 On October 5, One winner will be drawn to win two (2) tickets to see Elton John at Van Andel Arena on October 15, 2018! Employees of Forum Communications Inc, participating sponsors/promotional partners, other radio stations within a fifty mile radius of Otsego Michigan and the members of their immediate families are ineligible to participate or win.